This is a re-publishing from John Holt’s blog where our Chairman, Richard Edgecliffe-Johnson tells us about his favourite boot. Finally my last brand to be featured is London’s oldest shoemakers, Foster & Son with Chairman Richard Edgecliffe-Johnson giving his personal choice. “As Chairman of London’s oldest shoemakers I am blessed with a unique and wide ranging choice, but our bespoke “Saturday Boot” is one I keep coming back to. I love to see what I call “refined masculinity” in our designs, which is uniquely Foster & Son and I think may come from our long association with both the City and the Army. 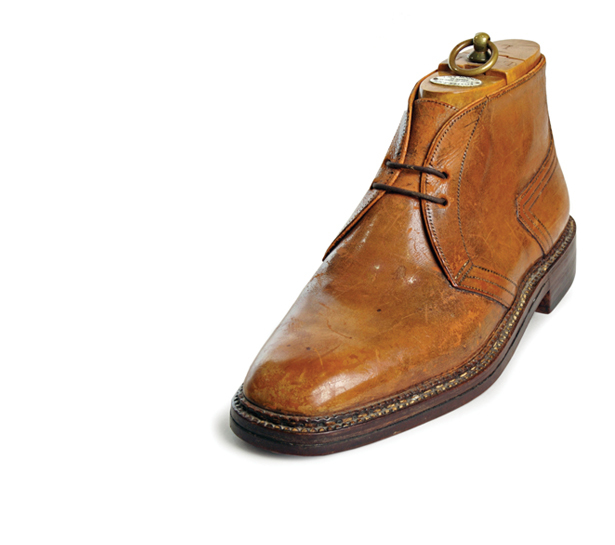 This boot has an extraordinary presence. It is definitely an “off duty” shoe, but it retains all the authority of a great and uncompromising design. While the storm welted sole looks rugged, and the angled back counters and facings give a dashing sense of forward movement, the perfect curves and soft chisel toe speak of subtle refinement in design. This I think is the essence of a great English shoe. You would never find this style anywhere else in the World, and that is why London remains and I hope always will be the greatest centre for custom shoemaking and design”.